432 Hz and 528 Hz The mystique of these two frequencies has captured the imagination of many music lovers and healing arts practitioners. These two tones come from very different schools of thought, yet when considered together they form an extraordinary harmony and quantum acoustic alchemy. What if the true secret purpose of these unique frequencies is to be sounded together? What if they have manifested on this planet in order to help unify and evolve our consciousness on both a personal and planetary level? Created by Healing Sounds Pioneer Jonathan Goldman, the 432 Hz/528 Hz INTENTION ENHANCERS utilize two special frequencies not normally combined as tuning forks. Each of these frequencies is said to possess unique attributes. When they are sounded together the power of these tuning fork frequencies is exponentially enhanced. 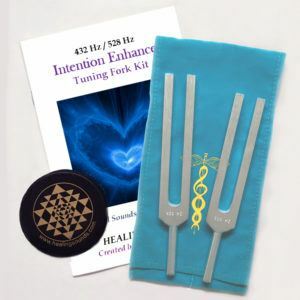 The 432 Hz/528 Hz INTENTION ENHANCER Tuning Fork Kit includes a booklet with detailed information on their creation, properties, and uses. 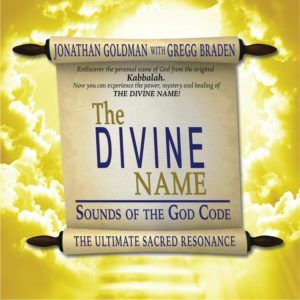 Bring the alchemical harmony of 432 Hz & 528 Hz into your own life! 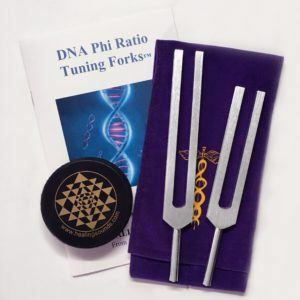 These tuning forks will enhance your connection with universal sacred sonic energy. Enjoy what may be one of the most extraordinary new vibrational ratios for healing and transformation!